The mass flux of a molecule at the interface of two immiscible solvents is governed by its lipophilicity. The more lipophilic a molecule is, the more soluble it is in lipophilic organic phase. For the same reason drug penetration into a biological membrane is also influenced by the lipophilicity of the drug. When a molecule is ionizable at a given pH, it forms a hydrophilic anion or cation and subsequently fails to dissolve in organic phase. Ionization of a molecule leads to the accumulation of the hydrophilic form in the aqueous phase. In contrast, its lipophilic form decreases in both aqueous and organic phase due to the law of conservation of mass. The partition coefficient of a molecule observed in a water– n -octanol system has been adopted as the standard measure of lipophilicity. The observed partition coefficient depends on the support electrolyte concentration of the bulk phase the compound is dissolved in. Extra ion-pair forming chemical agents added to the aqueous/organic phase may have a significant effect on the partitioning behaviour of a molecule. It is often meaningful to obtain the partition coefficients of molecules by calculation. The molecular structure and extent of ionization are the primary factors in calculating the partition coefficient. The standard partition coefficient of ionized and unionized species calculated from the molecular structure is based largely on the atomic log P increments given in Viswanadhan et al. The extent of ionization at a given pH is obtained from the predicted p Ka of the molecule. Our calculation method takes into account the effect of the counterion concentration on log D and log P .
The partition coefficient is the ratio of the concentration of the compound in octanol to its concentration in water. 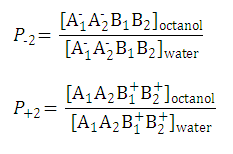 The distribution coefficient is the ratio of the sum of the concentrations of all species of the compound in octanol to the sum of the concentrations of all species of the compound in water. Based on acidic/basic dissociation reactions, we can introduce the concept of a partition coefficient for cationic and anionic species and for neutral species. The following figure gives the definition of partition and distribution coefficients for ionized and unionized species. 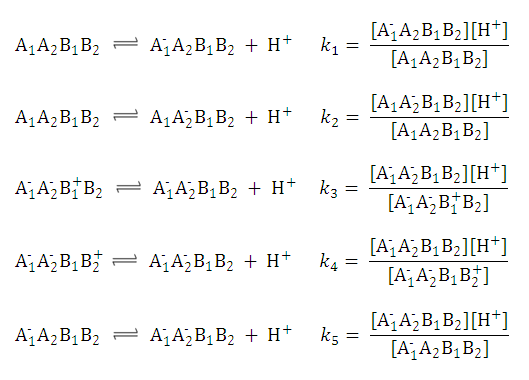 The partition and distribution coefficients for multiprotic compounds are defined in much the same way as for monoprotic compounds using the following formulae. In this example we suppose that a compound A 1 A 2 B 1 B 2 contains two acidic and two basic ionization sites. 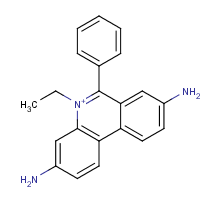 This compound has 16 protonation states in aqueous solution. The microspecies which are assigned to the protonation states are summarized in the following table. where pi is the micro partition coefficient of microspecies i. Similarly, one could show that P0 , P+1 , P-2 and P+2 are also pH-independent. LogP calculations are based on a pool of fragments predefined in the logP calculator. This set is based on the data set in Viswanadhan et al. Every fragment is assigned a unique name and a value. The logP value of a molecule is the sum of the fragment values that are present in the molecule. logP plugin handled only one fragment set until version 5.1.2, but then it was extended with two additional sets. The sets are based on a published data set (see Klopman et al.) and the PhysProp© database. These methods however are not available separately in the newer versions of the logP calculator. The trainable logP calculation (available from version 5.1.3) offers the user to define his own logP database and calculate logP values based on experimental data. New fragment value extensions make a more precise calculation possible. To have more information on the currently available logP calculation methods see this page. 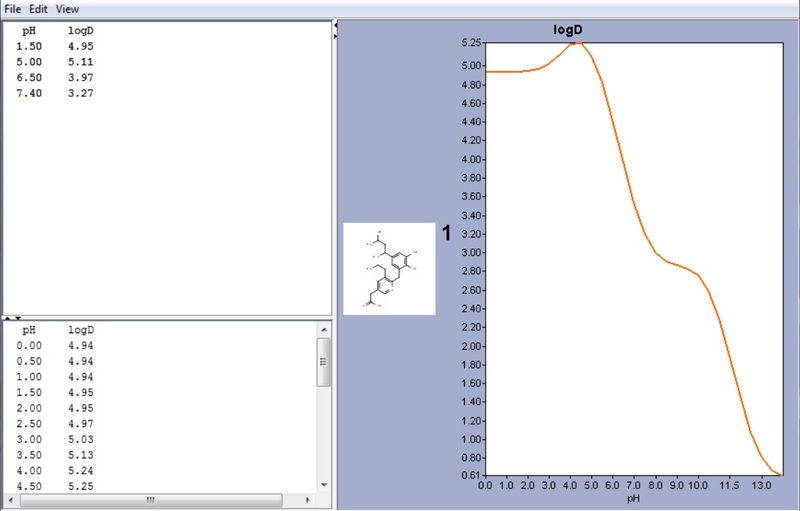 The following examples show logP/logD results for special molecules types. The calculations were performed with the default settings of the logP plugin. Homidium is a quaternary ammonium ion with strong hydrophilic character. Its log P is calculated with the use of the ionic fragment of the N + ion. The calculated and measured log P values are -0.91 and -1.10, respectively . 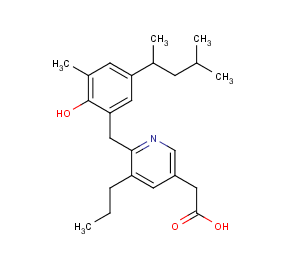 Ibuprofen has the typical log D vs. pH profile that is characteristic of acidic compounds. Lipophilic behavior of ibuprofen will be dominant when its carboxylic group is unionized (at low pH). At higher pH values the carboxylic group reaches the fully ionized state and hydrofilicity becomes more enhanced. The measured distribution coefficients also depends on the measurement method. The shake flask and the pH-metric methods are the most popular in practice. The figure below shows the calculated and measured log D of lignocaine as function of pH.